Severe burn injuries and broken bones affect millions of people every year. Such traumatic injuries can forever alter a person’s life, especially if they are not treated swiftly and with the best care possible. Two innovative projects to advance treatment and recovery for both conditions have been selected as the winners of the third annual Stepping Strong Innovator Awards. Michael Weaver, MD, of the Department of Orthopaedic Surgery, and Reza Abdi, MD, of the Division of Renal Medicine, each will receive a $100,000 grant for their work on measuring bone healing and treating severe burn injuries, respectively. 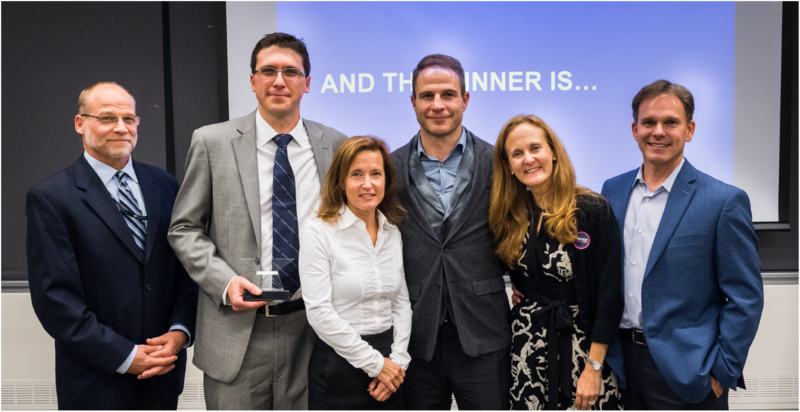 Weaver, program director of the Harvard Orthopaedic Fellowship at BWH, competed in a public voting competition that concluded on October 17 in the third annual Meet the Finalists event. More than 2,600 votes from all 50 states and 56 countries were cast in the competition. Weaver’s project, 21st Century Tools to Measure Bone Healing, was one of five to emerge from the Stepping Strong Clinical Innovation Series in Trauma—a five-part series of events in which participants came together to define a problem, refine key issues and challenges, and develop a solution. Weaver’s project will focus on developing a way to quantify how much a bone has healed. His team—comprising biomechanics specialists at Beth Israel Deaconess Medical Center and pharmacology experts at MGH—plans to measure microscopic changes in bone and how much motion occurs between the bone ends at a fracture site. Their ultimate goal is to test new treatments that could speed up bone healing. To learn more about how Weaver’s new tool for measuring broken bones may help shorten recovery, view this WCVB article. Pictured above: Reza Abdi, MD (second from the left), winner of the Stepping Strong Innovator Awards private voting competition, with Audrey Epstein Reny, collaborator Dennis Orgill, MD, and benefactor Timothy Diggins at the closed-door session on November 2. Reza Abdi’s project, New Hope for Trauma Patients with Severe Burn Injuries, was selected by a committee at a closed-door session on November 2. When patients suffer severe burn wounds, physicians must often rely on skin from a donor’s body to help heal and close a wound. But these donor grafts offer a temporary stopgap, as they are universally rejected, usually within 10 days. In collaboration with Stepping Strong Research Scholar Dennis Orgill, MD, PhD, Department of Surgery, and Ali Khademhosseini, PhD, of the Department of Medicine, Abdi is developing an implantable gel that can help extend the amount of time before skin grafts from donors are rejected, helping the patient survive through a critical period of recovery. The gel is embedded with adult stem cells that help temper the immune system’s response and prevent rejection of donor skin.